It is always great to find wonderful and enthusiastic Catholics in every corner of the world — and they ARE in every corner of the world. 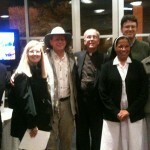 Here is a picture of the group that invited me down for a parish mission at St. Rita’s Catholic Church in Dallas Texas. What a great group of folks! Susan Sheetz, Fr. Mark Seitz and Joshua Whitfield, a former Episcopalian priest.Wish I knew all the others names but all of them were marvelous examples of the love of Christ! Love you all! I hope to visit again!